One united team and a ride of 435 miles to raise £15,000. 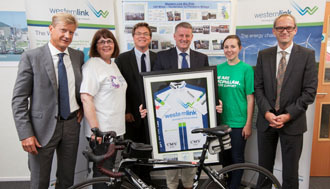 A team of cyclists from the Western Link project who took part in The Big Ride 2014, a 500-kilometre charity bike ride, recently presented Cancer Research UK and Macmillan Cancer Support with funds totalling £15,000. The Big Ride 2014 was created to celebrate the Western Link project, a joint venture between National Grid and Scottish Power Transmission. This pioneering £1 billion project will bring renewable energy from Scotland to homes and businesses in Wales and England via a 385-kilometre subsea cable route and, on completion, will play a major part in helping the UK meet its renewable energy targets. The challenging four-day event saw a core team of ten cyclists, including Patryk Rucki from Prysmian Group, depart from the project’s converter station site at Hunterston, West Kilbride on 5th September to follow the route of the Western Link cable as closely as possible through Ayrshire and the Lake District, along the north west coast and the through the Wirral to arrive at the Flintshire Bridge converter station site at Connah’s Quay in North Wales on 8th September. 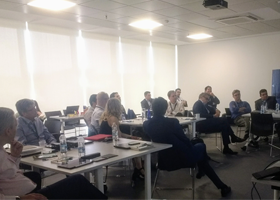 The main team, representatives from the joint venture companies and construction consortium, Siemens and Prysmian, were joined in support by colleagues who rode with them for the morning of the first day and the afternoon of the last. The demanding terrain the cyclists had to negotiate helped to galvanise them as a team as they supported each other and shouted words of encouragement to spur each other on. No greater example of this was on day three, their biggest challenge – cycling over 100 miles from Penrith to Blackpool and crossing the formidable Kirkstone Pass near Windermere. The exhaustion and elation was clear on their faces as each one reached the summit of the Pass at 454 metres elevation and saw the downward stretch into Barrow-in-Furness. As the final day of “The Big Ride” came to a close it was an impressive sight as the team, in their distinctive cycling kit, andaccompanied by additional cyclists for the final day, rolled down the long driveway to Flintshire Bridge. Cheers went up from those who had assembled to congratulate them. As they were welcomed back by Graham Edwards and Frank Witzel there was a sense of immense pride in what they, and everyone involved in the event, had achieved. One united team; 435 miles; £15,000 for charity.